In news that should shock nobody, Conor McGregor’s ‘retirement’ has been called into question yet again. However, this time it’s the Irishman himself and not fellow professionals fuelling the rumour mill. 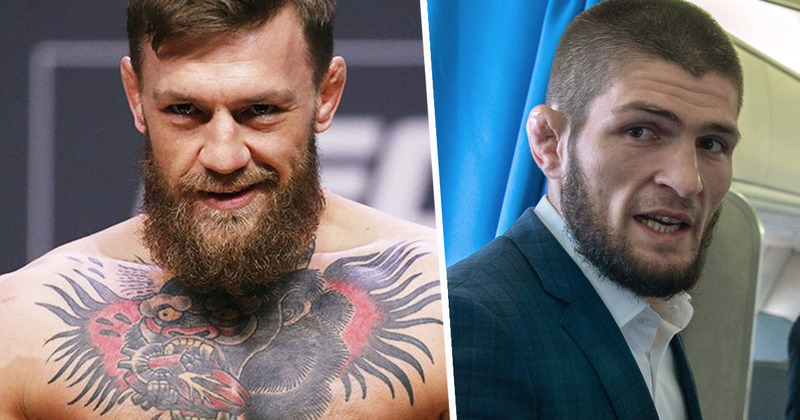 McGregor took to Twitter earlier today to call out his most recent opponent Khabib Nurmagomedov, and true to form he attempted to goad the Dagestani Lightweight UFC Champion into a rematch with a slew of insults – deleting one tweet which was certainly pushing the realms of taste and decency. McGregor lost to Khabib in early October 2018, submitting to a neck crank in the fourth round of their UFC 229 headliner. So far so normal. 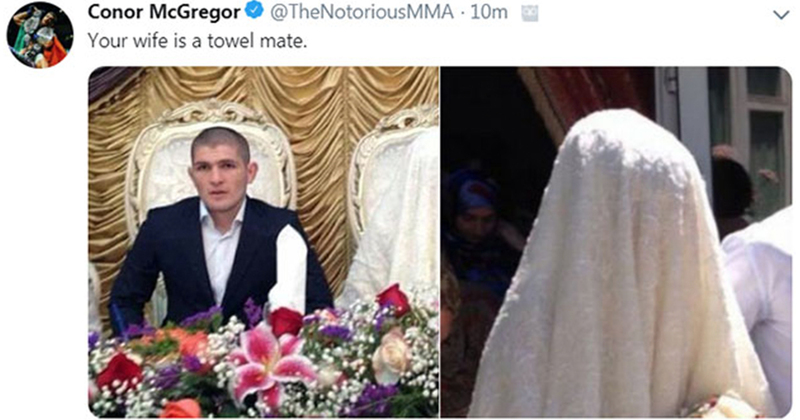 But the UFC’s first two division title-holder had to have a rethink of his approach deleting a post which included two images of Nurmagomedov’s wedding day and an insult aimed at his wife. Your wife is a towel mate. As reported by MMA Junkie, McGregor deleted the post after roughly 15 minutes. Whether of his own volition or a wise word from a member of his camp, deleting was probably for the best. Nurmagomedov famously launched himself from the Octagon following the close of their bout in October, diving on Dillon Danis, before all hell broke loose in the T-Mobile Arena as scuffles erupted between both fighter’s camps, and fans alike. After the fight Khabib confronted the media to explain his actions, questioning McGregor’s repeated insults directed at the people of Dagestan and those of Islamic faith. 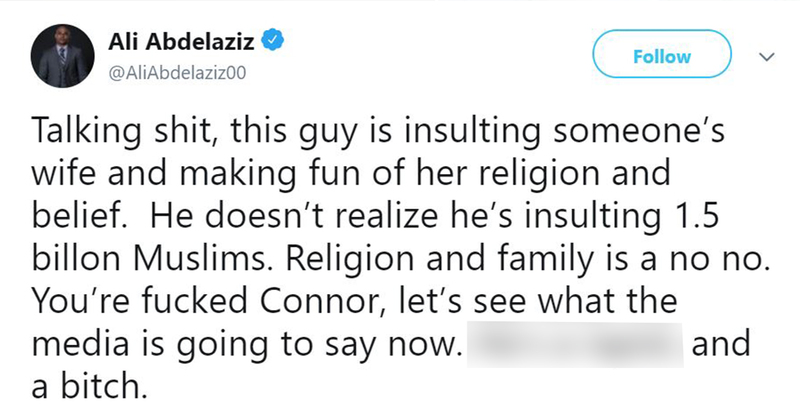 Khabib’s manager Ali Abdelaziz was quick to return fire on Twitter, pointing out the errors of McGregor’s past and including a hefty allegation that surfaced recently but is yet to be confirmed. The latest war of words follows McGregor announcing his retirement from MMA for a second time. Naturally fans and fighters are all skeptical, clearly with good reason. Nurmagomedov addressed the ‘retirement’ just yesterday. Conor acts like a jealous wife, who says ‘I will leave’ all the time but then comes back. So if the pair are to run it back, it appears McGregor is going to go down a similar route as before of scoring his most significant blows outside of the cage. What is it people say is the first sign of madness?